U.S. crude fell for a seventh consecutive trading session on Tuesday, briefly entering a bear market. The Trump administration on Monday reinstated sanctions on Iran's energy, banking and shipping industries. However, Washington granted temporary waivers to eight countries, including China and India, the biggest purchasers of Iran's oil. 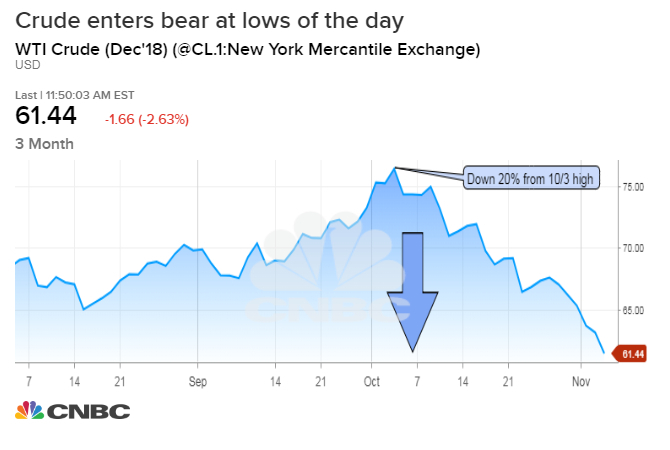 Oil prices fell on Tuesday, briefly entering a bear market, after the United States took measures to allow some of Iran's biggest customers to continue importing its oil without violating U.S. sanctions against the Islamic Republic. U.S. West Texas Intermediate crude ended Tuesday's session down 89 cents, or 1.4 percent, to $62.21 a barrel. At the session low, WTI touched $61.31, falling more than 20 percent from last month's nearly four-year high level of $76.90. There is marginal support for the commodity at $62 a barrel, according to John Kilduff, founding partner at energy hedge fund Again Capital. Below $62, the next significant support level is around $58 a barrel, he said. International Brent crude oil futures were down $1.27, or 1.7 percent, at $71.90 a barrel by 2:24 p.m. ET. The contract touched a nearly three-month low of $71.18, roughly 18 percent below last month's four-year high of $86.74. The Trump administration on Monday reinstated sanctions on Iran's energy, banking and shipping industries, marking the end of a 180-day grace period the United States set for oil buyers to wind down imports from Iran. However, Washington granted temporary waivers to eight countries, including China and India, the biggest purchasers of Iran's oil. The other countries allowed to continue importing Iranian crude for the time being are Greece, Italy, South Korea, Taiwan and Turkey. "The details are trickling out, so it's looking to be a bit more substantial than the market might have realized in terms of giving relief," Kilduff said. The inclusion of Japan and South Korea, which had essentially cut their purchases to zero, and the size of China's allotment in particular caught the market's attention, according to Kilduff. China will be allowed to import about 360,000 barres per day without triggering sanctions, Reuters reported, citing sources. "The sanctions against Iran are really more like suggestions now," said Scott Nations, president and chief investment officer of NationsShares told CNBC's "Futures Now". On Tuesday, the U.S. Energy Information Administration raised its outlook for American oil production next year. EIA now sees the nation's output averaging 12.1 million bpd next year. "U.S. production has exceeded EIA's previous expectations and, as a result, the short-term outlook now forecasts U.S. crude oil production to exceed 12 million barrels per day in 2019," EIA Administrator Dr. Linda Capuano said in a statement. The United States has increased output to more than 11 million barrels a day, surpassing Saudi and Russian production. Saudi Arabia and Russia have also been increasing output to offset the drop in Iranian exports. Amid ample supply, top crude exporter Saudi Arabia has cut the December price for its Arab Light grade for Asian customers.